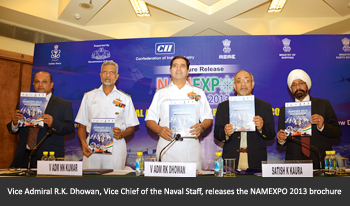 A Naval and Maritime Exposition (NAMEXPO) and Conference is being organised by the Confederation of Indian Industry (CII) in association with the Indian Navy, Ministry of Micro Small and Medium Enterprises (MSME), Ministry of Shipping, Ministry of Earth Sciences and the Government of Kerala from September 23-27, 2013, in the precinct of the Cochin Port Trust in Kochi. 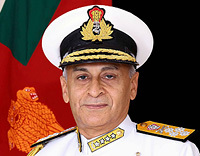 At the curtain-raiser ceremony of the pioneering initiative on September 16, 2013, Vice Admiral R.K. Dhowan, Vice Chief of Naval Staff, said that over the decades, our efforts in indigenisation have helped us achieve global shipbuilding standards, resulting today in 46 of the 47 warships and submarines on order for the Indian Navy being constructed in Indian shipyards. NAMEXPO 2013 is a pioneering venture being laid on firm foundation to hold bright prospects for the Indian industry. The unique concepts enshrined into NAMEXPO 2013 have elicited enthusiastic response from all the stakeholders which in turn has encouraged active support from the Ministry of Shipping, Ministry of MSME, Ministry of Earth Sciences and the Government of Kerala. Despite being the first exposition of its kind, all the stakeholders have offered an overwhelming response to the Confederation of Indian Industry (CII). 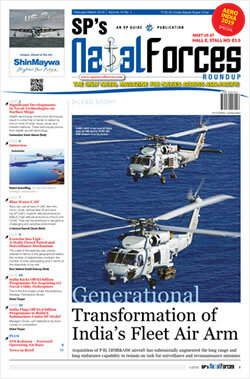 Over months of preparatory works CII have ensured to provide a common platform to end-users and manufacturers to know and understand each other’s capabilities and requirements.